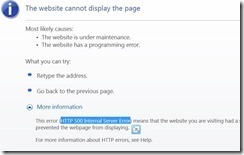 HTTP 500 Internal Server Error – While deploying a website created in ASP.Net and .Net framework 4.0 in IIS 7.5. 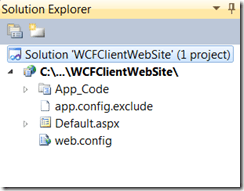 I created a website in ASP.Net and published it to a location in the hard drive within the default projects folder of VS2010 (C:\Users\\Documents\Visual Studio 2010\Projects\\PrecompiledWeb). For me this error kept cropping up and the reason was that the account on which the app pool was running did not have access to the physical location of the website files. You can check the account by going to Application pool node -> Select the app pool -> click Advanced settings on the left menu and scroll down. Ensure that you provide read access to the physical location. Once you do the error goes away.